The group builder allows campaign audiences to be created based on actions carried out by individuals. 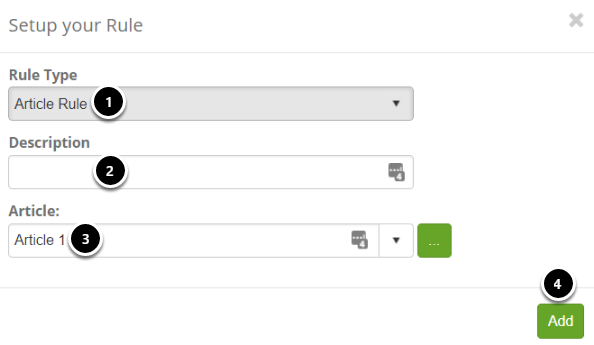 Include or exclude contacts based on Contact data (Contact Rules). 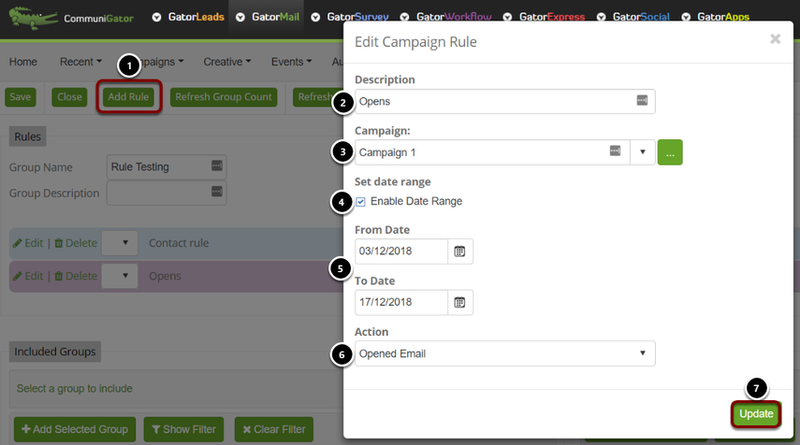 Include or exclude contacts based on Campaign data (Campaign Rules). Include or exclude contacts based on Survey data (Survey Rules). 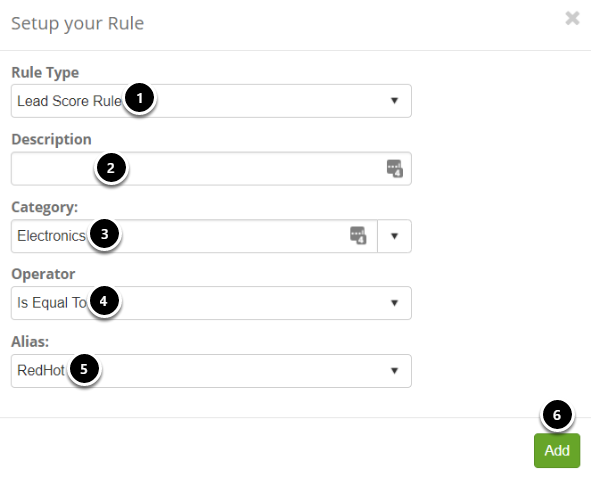 Include or exclude contacts based on Lead Score data (Lead Score Rules). Include or exclude contacts based on Article data (Article Rules). A contact rule is based upon information that is held about an individual in the database. Select "Contact Rule" from the drop-down menu provided. Enter a "Description". A description will help when understanding the rule's purpose. Select a "Contact Field". This is a list of all the user attributes that are held in the database. 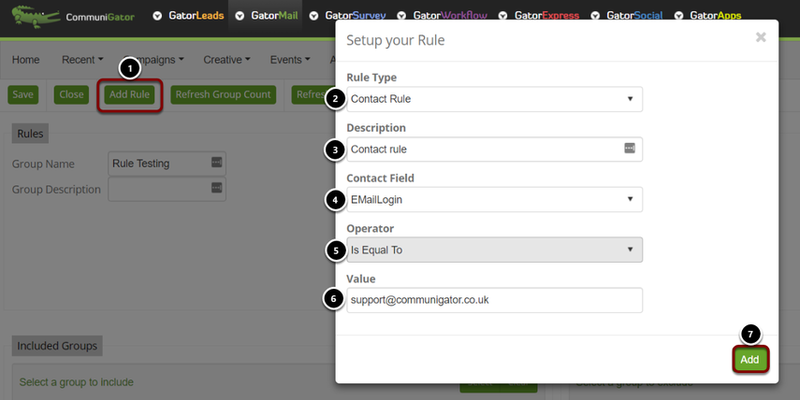 Select the field from which you would like your contact rule based upon. For example, if you wanted a specific contact added via their email, you would use "EMailLogin" for example. Select the "Operator". The options include 'Is Equal To', 'Is Not Equal To', etc. Enter the value that you want to search for. In this case a specific email address has been entered. The system will search for anyone who matches that email in your contact database and add them to the group. Once a rule is added it will appear in the manage group screen. The description appears with the number of contacts to whom the rule applies. The rule is then added and the count shows you how many are in the group. Add a campaign rule when you would like a list of people who have performed a task e.g. opened and email, clicked a browser link, etc. Click the "Add Rule" option. Select "Campaign Rule" from the drop-down menu provided. Enable a Date Range by checking this box. It will show an option to enter a date range. Set the Date Range. For example all contacts who opened the selected campaign between 03/12/2018 and 17/12/2018. Select an appropriate "Action" e.g. Web Hit, File Downloaded, Landing Zone Hit, Download Document, Unsubscribed, Opened Email, Not opened Email. Select "Add" or "Update" if you have edited the rule. Add a survey rule when you would like to include a list of people who have answered a survey question in a particular way. 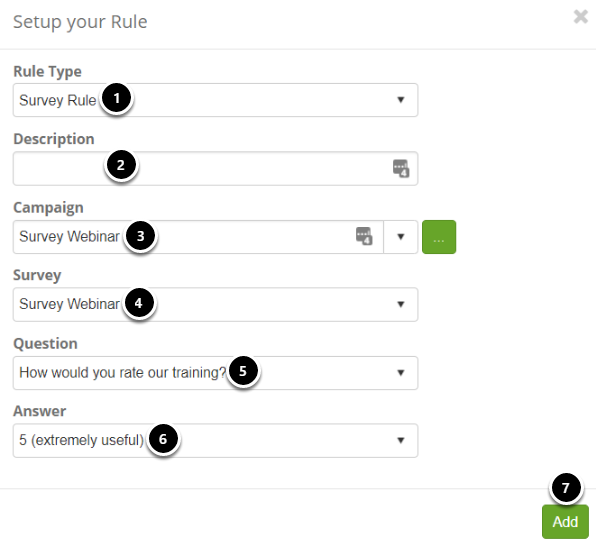 Select "Survey Rule" from the drop-down menu provided. Enter a "Description". A description will help when understanding the rule's duty. Select the appropriate "Campaign". The screen will automatically refresh, and a list of surveys associated with the campaign will appear in the Surveys dropdown list. Select the appropriate "Survey". This will populate the Questions dropdown list of all questions of type, Radio-button, Checkbox, list-box and dropdown list from the survey. Select the appropriate "Question". This will populate the list of Answers. 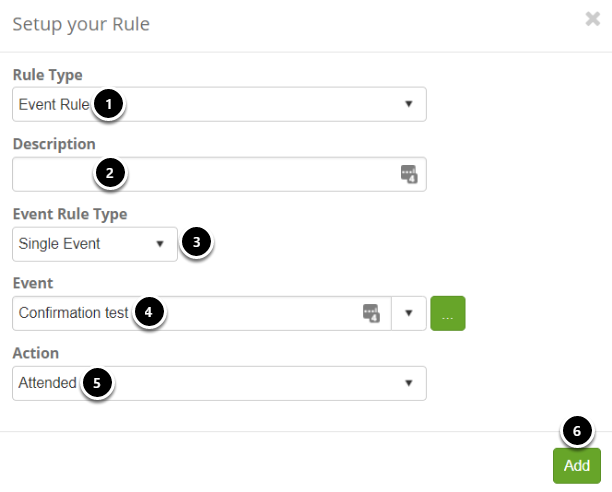 Once a rule is added, it will appear in the manage group screen. The description appears with the number of contacts to whom the rule applies. Add a lead score rule when you would like to include a list of people who have reached a certain lead score. Select "Lead Score Rule" from the drop-down menu provided. Select the appropriate "Category". The screen will automatically refresh, provide options to enter the operator and alias. Select the appropriate "Operator". This screen will refresh and provide an option to enter a value. Add a event rule when you would like a list of people who have attended, booked an event. Select the appropriate "Action". This screen will refresh and provide an option to enter the action value. Select the appropriate "Action Value"
Add a article rule when you would like a list of people who have received a certain article.